It’s important that fire exit signs are illuminated by a reliable light source—one that will stay lit when the power goes out. Photoluminescent exit signs direct people safely when lighting is compromised and time is critical. Fire Regulations dictate that fire exits are clearly marked and must be seen even in the event of power loss. How many emergency exit signs do you need? There need to be enough exit signs to clearly mark the path to follow to exit safely. The number will depend on the size of the building and the number of exits. Any doors along the exit route that are not exits need to be labeled indicating its actual use (e.g., closet) or “Not an Exit”. Each fire exit door should have at least one set of signs leading to it. So if you have two fire exits, you’ll need at least two separate sets of signs. When placing signs, bear in mind that at least one fire exit sign should be visible at all times. This is so that nobody gets lost or confused and takes the wrong route. Remember, at least one sign should always be visible. This may mean opting for a large sign or investing in a suspended sign to place midway down long corridors. Fire exit routes must be free and unobstructed. No materials or equipment may be placed, either permanently or temporarily, within the exit route. It should take people to the nearest emergency exit as quickly as possible. If there is more than one way of reaching the same emergency exit, give directions for the shortest route. If both routes are equally as short, each path should be marked with a separate set of signs. The exit access must not go through a room that can be locked, such as a bathroom, to reach an exit, nor may it lead into a dead-end corridor. Stairs or a ramp must be provided where the exit route is not substantially level. 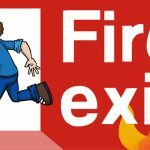 Call Fire Control Systems for help with your fire exit sign needs.